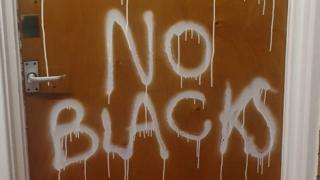 A man who painted racist graffiti on doors at a block of flats has told a court he cannot explain why he did it. Vaughan Dowd left David Yamba, 10, "terrified" by writing "no blacks" on the door of his home in Salford, five days after the Yamba family moved in. The 54-year-old of Irlam Square, Salford, admitted racially aggravated criminal damage at a previous hearing. At Manchester Crown Court, sentencing was adjourned until 10 May for preparation of a psychiatric report. The court heard trainee solicitor Jackson Yamba, 38, came across the graffiti on the morning of 8 February. Ann Deakin, prosecuting, said the boy told his father: "Daddy, something is written on the door." CCTV footage showed Dowd covering his face to carry out the attack before returning to the flats with his face uncovered. Last month, Dowd pleaded guilty at Manchester Magistrates' Court to a single count of racially aggravated criminal damage. Dowd's barrister Iain Johnstone said: "Mr Dowd is unable to give any rhyme or reason as to why he acted like this. "To a certain extent that is supported by a very good mix of character references by those who know him well. "They speak of a mild-mannered and quiet man who would not say boo to a goose." He said Dowd's family speculated he could be "heading towards a breakdown" because he was taking medication that "may have had an effect on his behaviour". Judge Alan Conrad QC replied: "Sheer and simple racism might be one reason, mightn't it?" The judge agreed to adjourn the case and further remanded Dowd in custody at HMP Manchester.